JumpSquares is a bookmarking tool where you can create “squares” supporting different connections. One issue is the launching of SSH sessions from a hyperlink when using Chrome. This simple script and registry change will allow putty to be launched from a ssh hyperlink. 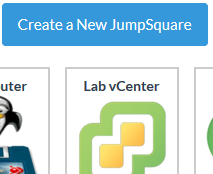 If you have trouble keeping up with all the different access UIs and servers in your lab (vCenter, vCOPs, vCO, NAS Admin UI, etc, etc, etc) JumpSquares may be the simple (and FREE) solution you are looking for. You can Bookmark the URLs for Administration interfaces along with the ability to launch SSH, RDP, or VNC from the JumpSquares Dashboard.